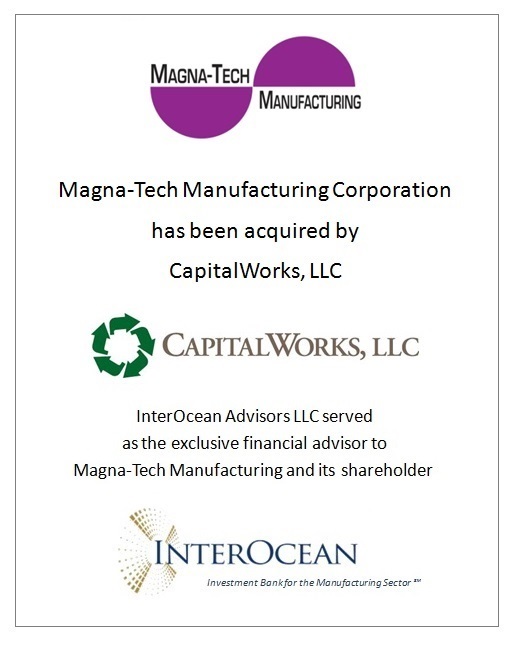 InterOcean Advisors LLC (“InterOcean”) announced today that Magna-Tech Manufacturing Corporation (“Magna-Tech”) has been acquired by CapitalWorks, LLC (“CapitalWorks”), a private equity firm focused on control investments in middle-market companies in the United States and Canada. InterOcean served as the exclusive financial advisor to Magna-Tech and its shareholder. Magna-Tech Manufacturing Corporation is the largest independent provider of vacuum impregnation sealing solutions in North America for both cast metal and electronic components. The Company also offers metal machining, leak testing, chromating, cleaning, shot blasting, sub-assembly and thermal deburring services. Its customers primarily produce components for the automotive, railcar, pleasure boat, electric motor, electronic module and wire/cable industries. Magna-Tech is headquartered in Muncie, Indiana. “We are very excited to be partnering with the CapitalWorks team. CapitalWorks will provide Magna-Tech with additional financial and management resources to facilitate further penetration into our current markets and entrance to new component sectors and geographic regions,” said Dan Irvin, President of Magna-Tech. “As a result of its long-term commitment to provide local and reliable quality services tailored to the needs of its customers, Magna-Tech has developed important relationships with many suppliers of critical cast aluminum and electronic components. Many additional opportunities exist for the application of its capabilities, which will support important future growth,” stated Bill Doepke, Managing Director at InterOcean.